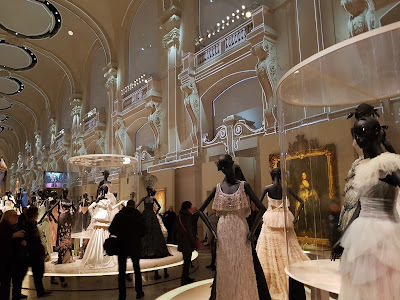 When I heard that the Christian Dior exhibit at the Musée des Arts Décoratifs in Paris was not to be missed and was ending in early January of 2018, I decided that I should go! Now! I can get to Paris in 3 1/2 hours so I decided a day-trip was in order. I arrived in Paris about two hours before my timed-ticket entry of noon. Originally I'd planned to walk from the train station and stop at a fabric store or two along the way but it was freezing cold outside, so I took the metro. I thought it was still too early to go to the museum so after a pastry and coffee I checked out a nearby ribbon shop called Mokuba. They have an incredible selection of ribbon but since I didn't have any need for any at the moment I just browsed. I also peeked in the window of Kaetsu , another fabric shop I'd read about, but it wasn't open until noon. It turns out it's not so much of a fabric shop as a boutique that makes bags and other accessories out of Japanese fabric. They may also sell some of the fabric, but I couldn't tell - it was a really tiny store too. By now it was time to make my way over to the museum. It was about 11:30 am but I probably should have gone over there earlier because there was a huge line outside - and these were all people with 12:00 tickets. It was cold but fortunately not raining so I waited with everyone else and watched as more and more people arrived. As you might expect, the majority of the crowd were female and many were "fashionably French" but others were pushing my fashion envelope for sure. I didn't get any photos because I didn't want to be rude, but my favorite look was an older woman wearing a knee-length bright green fur coat, red tights and purple shoes - or maybe it was purple tights and red shoes, I can't remember but she definitely stood out. I finally made it inside around 15-20 minutes past twelve. 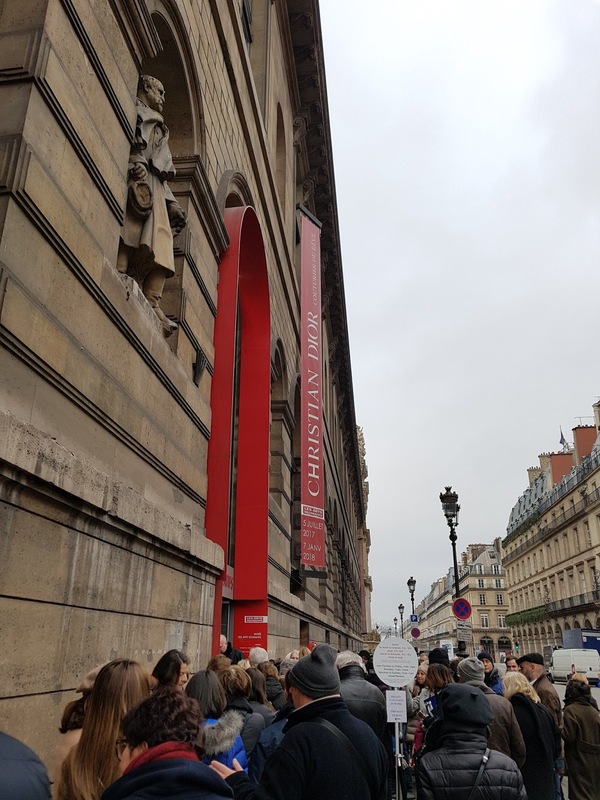 I followed the crowd and headed straight for the exhibit, unfortunately forgetting to check my winter coat, and I wasn't alone in this as I saw most everyone else wearing their coats. As often happens in these large, popular exhibits, the early rooms were very congested while people tried to read and observe every little thing, afraid to move on and miss something. I was pushed by people more than once and bumped countless times and bulky coats certainly didn't help! In one very crowded room a museum worker periodically instructed people to keep moving. 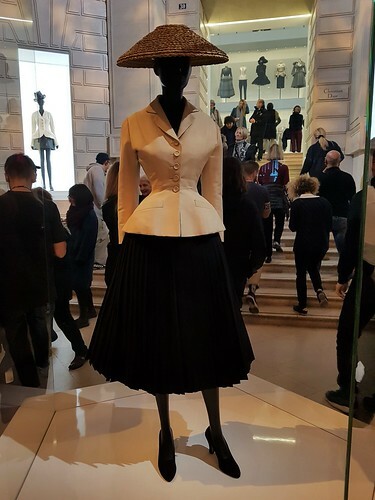 I didn't really know much about Dior except for his infamous "New Look", the change in fashion that he initiated in the post-war 40's. The first room contained a lot of historical information and pictures but unfortunately it was so jammed with people I felt claustrophobic while trying reading anything so I moved on. I looked up information about Christian Dior afterwards and was surprised to learn that he died quite young, at 52, in 1957. 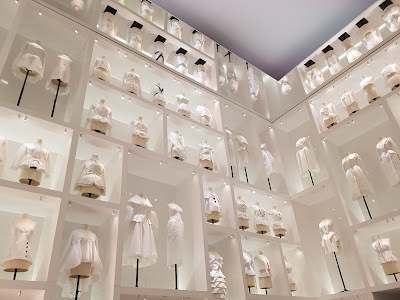 Now I understand why so many of the clothes were labeled "Christian Dior" followed by "John Galliano" or "Yves Saint Laurent" or "Mark Bohan." These were some of the creative directors who took over the House of Dior after Christian's death. 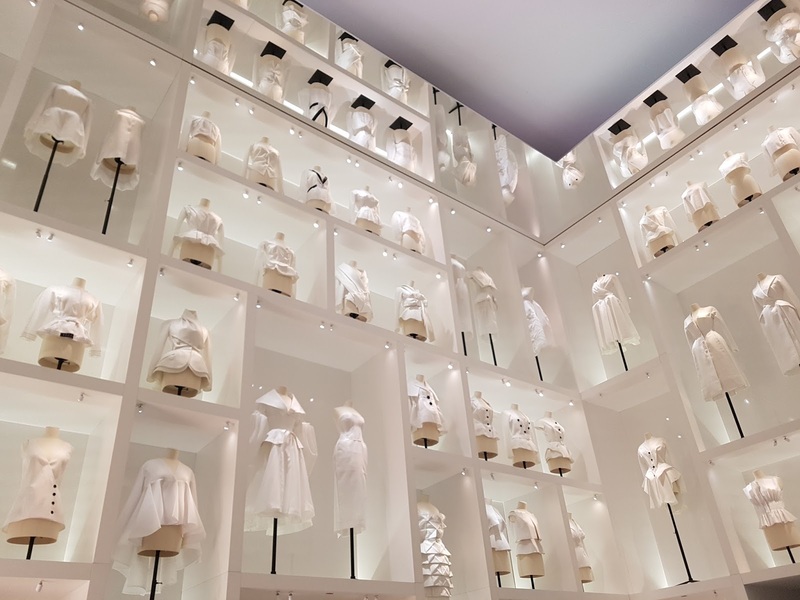 This exhibit represents the bulk of the Dior creations over many, many years and not just from Christian Dior himself. And what an exhibit it is! I took lots of pictures with my phone and have put together an album of them, which you can view farther down in this post. 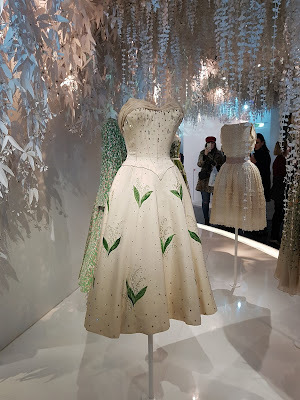 My favorite exhibit was one that showcased groupings by color of Dior clothes - full size and in miniature (which I adored! ), hats, shoes, jewelry, perfume and artwork. Another favorite room was one that focused on the floral pieces. The ceiling was decorated with paper cutout flowers and leaves and it was just beautiful. Another room showed the pieces in muslin (toile) form, filling the room vertically, which was an elegant way to showcase them. I would have loved to have been able to see the dresses closer up to see the design elements. 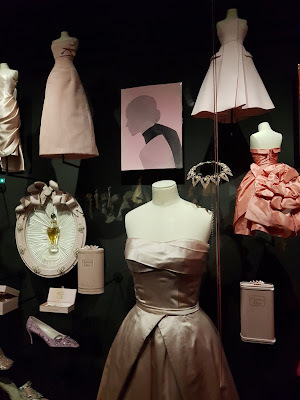 Towards the end of the exhibit was a room that looked like a grand ballroom and it fittingly contained ballgowns, including one worn by Princess Diana. So many lovely gowns! I wish I could have spent my time admiring and studying each piece but that was impossible not just because it was crowded but because there was so much to see. I spent about two hours there and was exhausted afterwards. After the exhibit and lunch, I took the metro to visit another fabric store I'd read about. 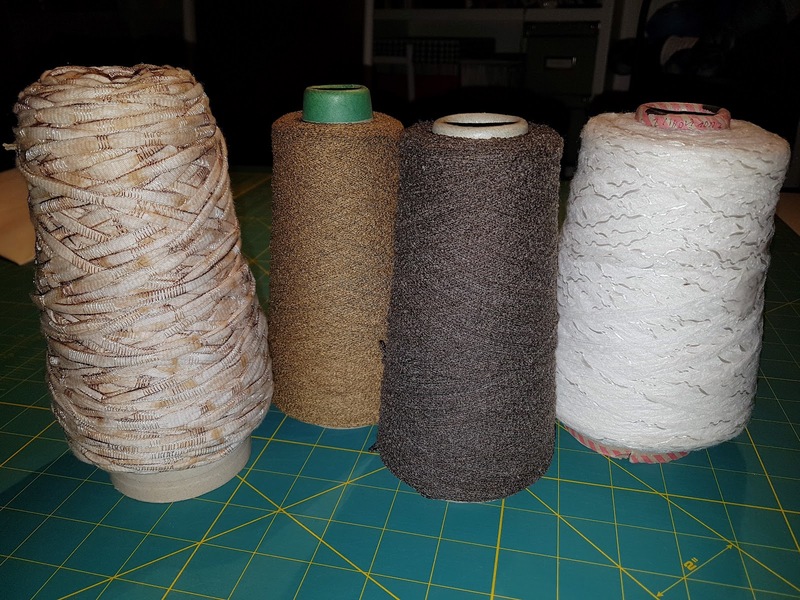 Mahlia Kent is a weaving studio that supplies woven fabrics for designers and also sells yardage or sample pieces. They're located in a very cool space built under a railway bridge that has been re-purposed into studios and retail shops with a landscaped walkway above, known as the Coulée verte René-Dumont. I browsed a bit through the small sample pieces, which could be used for small bags or combined into larger pieces, but there were so many that it made my head spin. I was more attracted to the cones of yarn on their shelves that were also for sale - these are probably leftover yarns from their weaving. I bought four small cones of yarn to play with on my loom. Had I not been limited by what I could easily carry and not planning to shop more, I might have bought more! My next stop was Anna Ka Bazaar, another fabric shop I'd read about but had never visited and located in a trendy looking area a short walk from the Coulée. It's a nice little shop but not really my aesthetic. At first glance it looked more like a "twee" craft shop with glass jars of color-coordinated ribbons and buttons, but then I saw that they also stock yarn, patterns and fabric. It looked like they'd just gotten a shipment of printed cotton knits, which I liked but not enough for the price they wanted. 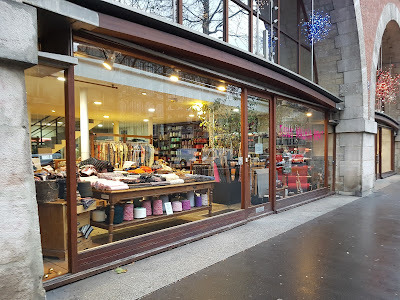 With two more hours until my train, I dashed to the metro in the rain and rode it to my usual fabric shopping mecca in Montmartre, home of Tissus Reine and Marché Saint-Pierre Dreyfus and many little "coupon" shops that sell pre-cut pieces of fabrics. I browsed and browsed as much as I could in the time I had left, but there wasn't any fabric that I felt I needed to buy. There was a small leather and animal skin shop with some nice pieces but I couldn't come up with a project to justify buying anything. Well, actually I could think of many projects but my list is long enough already. It was a great day! Long and exhausting and it rained off and on, but still a really great day. Wow, what a stunning exhibit. I can see how that would be an exhausting day..